Home > Projects > DIY > DIY Home Improvement: How To Install A Faucet! 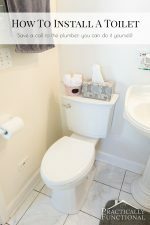 This is a Sponsored post written by me on behalf of Moen, Incorporated. All opinions are 100% mine. Living in a rental doesn’t mean you can’t make your home your own! 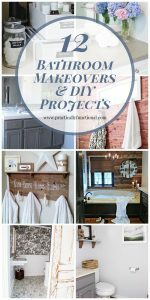 You can’t usually paint a wall or any other large DIY projects to customize a rental, but one DIY project you can do is to switch out your bathroom faucets! Moen sent me a Moen Boardwalk Centerset bathroom faucet in Chrome to try out, and I just love how it looks in our bathroom. A new faucet can make a huge difference in the overall look and feel of your bathroom, and the best part is, installing a new faucet is something you can do yourself! 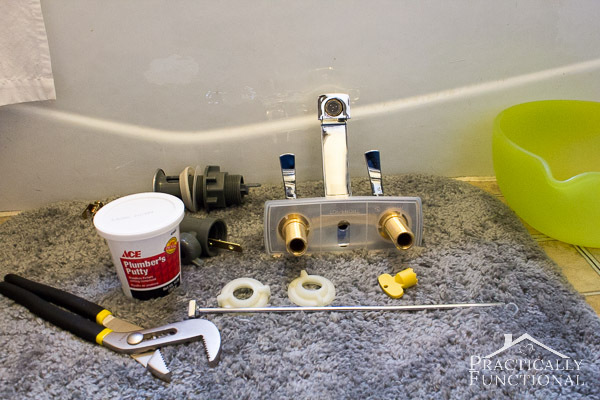 For most people, plumbing is one of the bigger “scarier” DIYs out there. And it makes sense! My dad jokes that plumbing projects are measured not in hours but rather in trips to the hardware store because they always end up bigger than you expected. But it doesn’t mean you can’t do it! It just means be careful, cautious, and know what you’re getting yourself into. 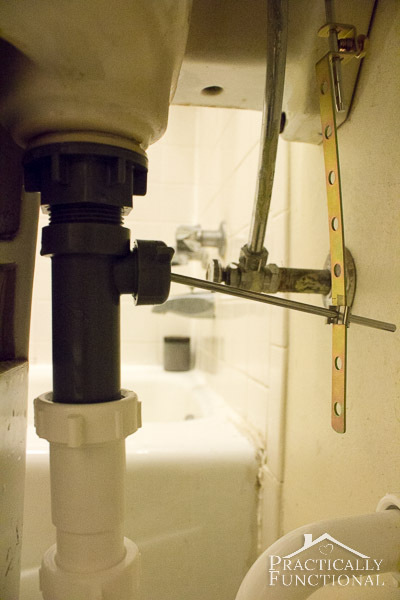 If your plumbing is new-ish, you shouldn’t have any problems. But if the plumbing in your house hasn’t been updated since it was built over a hundred years ago, you may be dealing with corroded pipes or some other issue, so just be careful as you proceed. 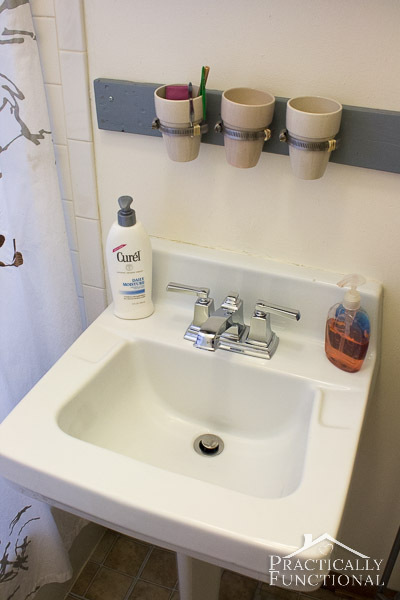 And remember, you can still do this if you’re renting; just keep the old faucet so you can re-install it when you move out, or be prepared to leave your brand new faucet as a gift for the next tenant! The actual installation of this faucet was incredibly quick and easy, but of course, my dad was right about the trips to the hardware store! There were some weird issues with the existing plumbing in our apartment; the old faucet was calcified and it took us over an hour just to get the bolts loose, and some of the pipes connecting to the wall were corroded and burst halfway through the installation process! So we ended up making a bunch of trips to the hardware store, and the whole thing took about four times as long as it should. But, when we finally got the old faucet off and got the corroded pipes replaced, installing the new faucet and hooking it up to the water lines only took a little over an hour! 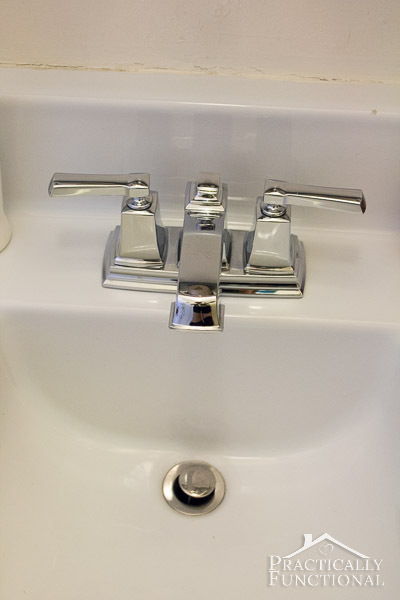 Here’s what our old faucet looked like: boring, old, and ugly! The hot water handle stuck out at an odd angle and turned the wrong way, the drain was corroded and gross, and the drain stopper was broken and no longer actually plugged the drain at all. 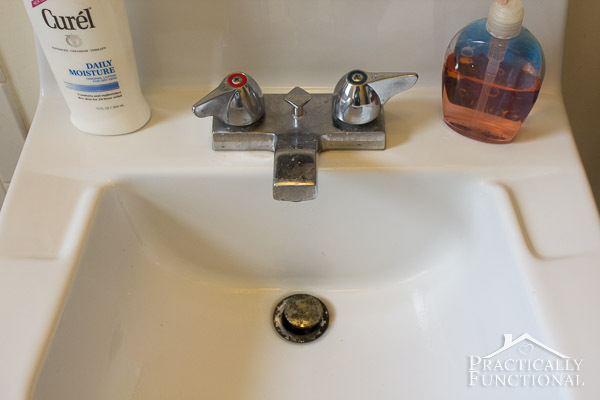 The first thing you have to do is clean up the area under your sink so you can access the plumbing. We have a pedestal sink which makes it a little easier, but if you have a cabinet, just pull everything out of the cabinet and get a flashlight so you can see what’s going on. Place the bowl under the plumbing because water will drip as you unhook it all. Once your work area is clear, turn off the water to the sink. Look under your sink and follow the pipes and tubes until they go into the wall; somewhere near where they attach to the wall will be shutoff valves (there should be two: one for the hot water and one for the cold). Next, uninstall the old faucet by unhooking the water supply lines and undoing the nuts that are holding the actual faucet onto the sink. 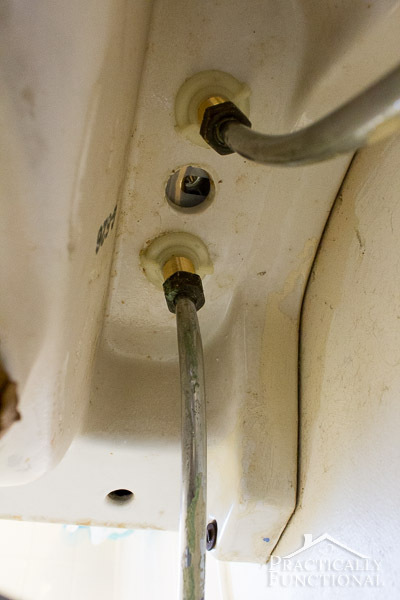 Everyone’s sink will look different but there should be some nuts screwed on to giant bolts up near the sink itself, which attach the faucet to the sink, and there should be some more nuts about an inch lower down that connect your water supply lines to the faucet handles. See all the blue-ish green stuff on the one faucet connector? That’s corrosion and calcium and that’s why it was so dang hard to remove the old faucet; it took over an hour just to get the nut to start to turn! Once the old faucet is out, clean out the sink and installation holes, cuz eww! Then install the new faucet. Your new faucet will come with directions, just follow those; but the basic idea is to put in the new faucet the opposite of how you took the old one off. 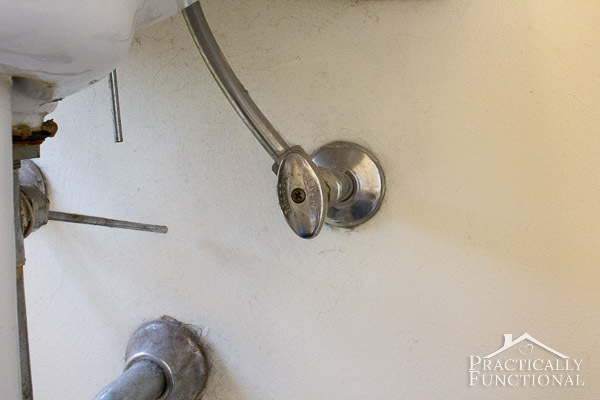 Put the faucet bolts through the installation holes, screw on some nuts to hold the faucet onto the sink, then reattach the water supply lines. Here’s what our faucet looks like after the new faucet was installed. The next step is to uninstall the old drain. Again, each sink is different, but on our sink there was one giant nut holding the drain onto the sink itself and another nut holding the bottom of the drain onto the pipe below it. We undid both nuts and were able to push the drain up out of the sink and remove it. Again, clean up the grossness in the sink near the drain area, and then it’s time to install the new drain! Put a generous amount of plumber’s putty on the underside of the drain. 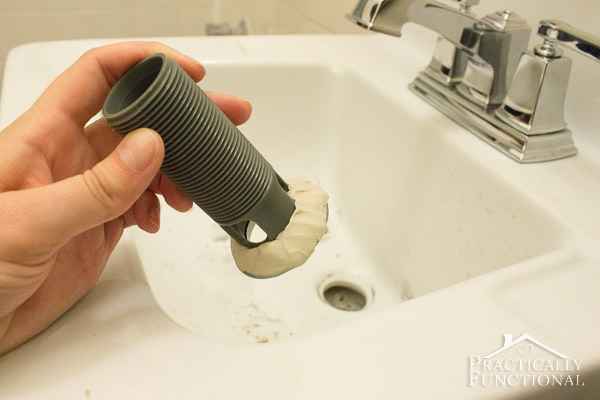 Don’t worry if there’s way too much; plumber’s putty is a waterproof sealant that never dries hard. It’s not like a glue and you will be able to wipe away the excess any time after installing the drain. Put the drain down into the drain hole, and then follow the instructions that came with your faucet to finish the installation. Basically you’ll put a gasket on the underside of the drain, add a washer, and then tighten the whole thing on with another giant nut. But don’t tighten that nut all the way yet because there’s one more piece of pipe that will connect the drain to the pipe coming out of the wall. Follow the instructions that came with your faucet to finish installing the pipe that connects the drain to the piece of pipe coming out of the wall. Basically you’ll just need to stick it in there and tighten the nut above and below it, but make sure the opening in this piece of pipe points towards the wall before you tighten both nuts. Drop the drain stopper into the drain, and drop the long, skinny handle into the top of the faucet between the hot and cold water handles. Again, follow the instructions that came with your faucet, but basically there’s a lever with a ball on it that you’re going to put into the opening in the back of the pipe so that it can lift and lower the drain stopper. You’ll screw on a little cover to close the opening in the pipe and then you’ll attach the lever to the long, skinny handle coming down from the faucet. At this point you’re done! Turn the water back on and test out your new faucet! Leave the bowl where it is until you’re sure that there are no leaks. 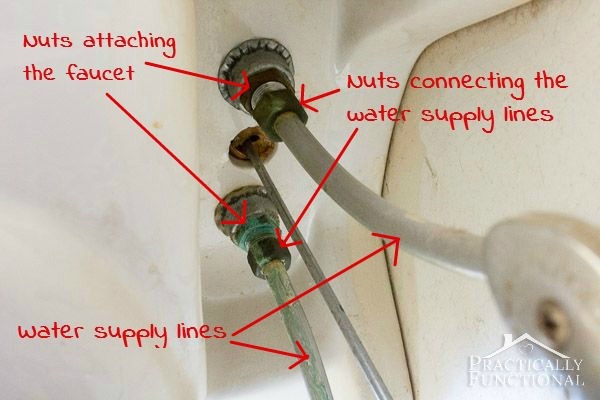 Tighten any nuts if you see water coming out anywhere other than the faucet itself. 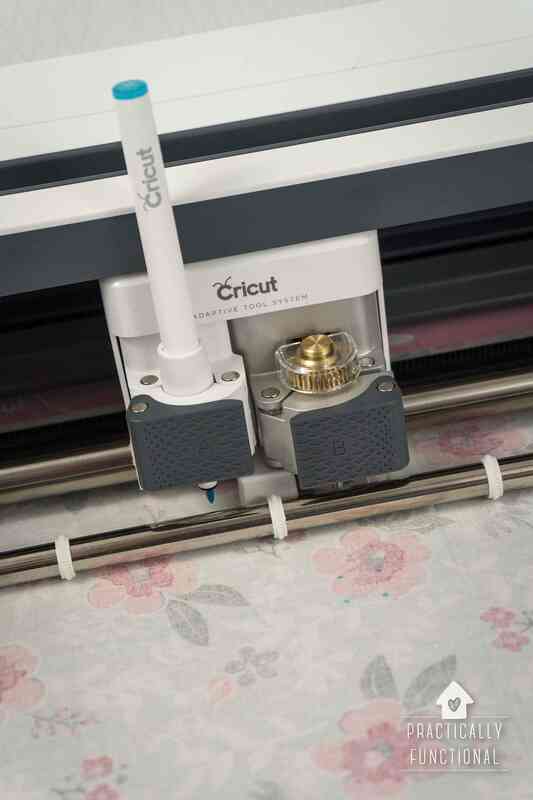 Once there are no more drips anywhere, you’re done! Stand back and admire your new faucet! Look how pretty that thing is! 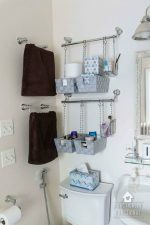 It really classes up the entire bathroom! It’s amazing how much difference a brand new faucet can make! If your bathroom needs a little bit of love, Moen faucets can be purchased at Lowes and installed by you! 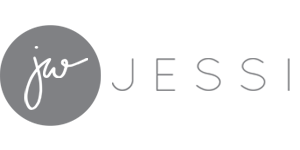 And make sure you Like Moen on Facebook for more great bathroom ideas! « Make Your Own Envelope Pillow Covers! love this faucet and never really did know how to replace one! just bought a house and it has 80’s faucets. eeek. heading to lows to check these out! Eek is right! 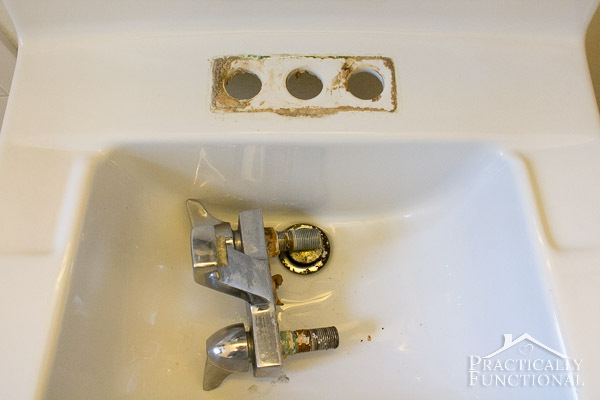 I can’t believe how much of a difference replacing this faucet made to this bathroom, so definitely give it a try if you find a great new faucet! Oh my gosh I bet! The new faucet looks great! We have redone a lot of our kid’s bath, but I think we are going to get a new faucet as well. We have replaced the one in the kitchen and it makes such a huge difference with how your sink looks. Beautiful facet, and great tutorial!!! Our walls were just boring off-white, but this faucet is a huge improvement so I’m sure they’ll be happy! You go girl! That is awesome, and looks so simple! Glad you got a fancy new faucet…it looks SO good! It’s amazing what a difference that can make–your room looks so much better! Love it! Definitely makes a HUGE difference! Awesome post! I am definitely pinning this for later! Ha! Now I can tell my husband I don’t need him anymore 😉 Thanks for the great tutorial. Huge difference! I love your new faucet and looks easy enough to install using your tutorial. You have inspired em to try to do mine! Thanks Jessi. Hey Jessi, this is a great guide! I just shared it with my sister and she thought the pictures made it so easy to understand! Thanks for the help! I’m so glad you guys thought it was helpful! I know when I first tried to install a faucet, I had the hardest time figuring out what the instructions were talking about, so I figured pictures could help! 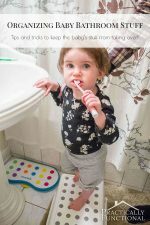 This is an awesome step by step post! Great job highlighting this stuff at a high level – so many people get really confused about what gets tightened down where with home improvement projects. Sinks are especially complex!